Decora Combination Duplex Receptacle And USB Charger. 20 Amp. Black. 20 Amp, 125 Volt, Decora Tamper-Resistant Receptacle, NEMA 5-20R. 3.6 Amps, 5VDC, 2.0 Type A USB Chargers. Grounding, Side Wired & Back Wired - Black. Finally, Your Home Gets Its Own App The Belkin WeMo Switch and WeMo Motion Kit gives you wireless control of your home appliances and electronics, turning devices of your choice on or off as soon as movement is detected. The sensor plugs into an outlet and detects motion up to 10 feet away. It then sends a wireless signal to the WeMo Switch to turn the connected device either on or off. Download the free WeMo app to any Apple device (iOS 5 or higher) to program a light to turn on when you walk into the house or a fan to turn off when you leave. Combination Duplex Receptacle And USB Charger. 20 Amp. Black. The Leviton USB Charger/Tamper-Resistant Duplex Receptacle offers two high-powered USB Ports with 3.6A of charging power and two 15A or 20A/125V Tamper-Resistant Receptacles. It has the capability to charge two USB powered electronic devices utilizing its two USB Ports, leaving the two Tamper-Resistant Receptacles free for other uses. 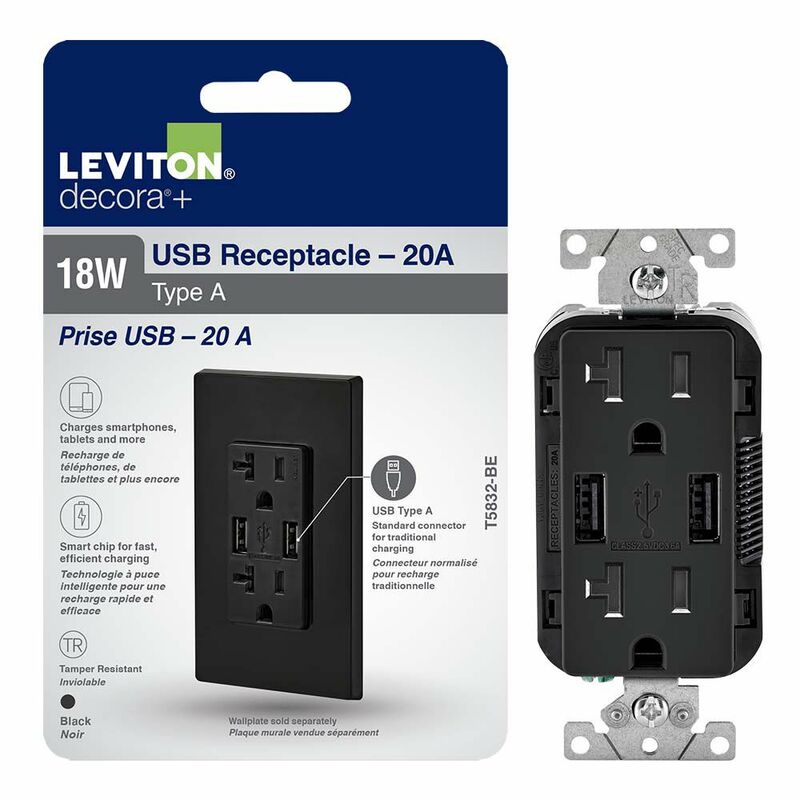 The Leviton USB Charger/Tamper-Resistant Duplex Receptacle is designed to charge tablets, smart and mobile phones, gaming devices, e-readers, digital cameras and a host of other electronic devices. Combination Duplex Receptacle And USB Charger. 20 Amp. Black. is rated 4.5 out of 5 by 2. Rated 4 out of 5 by Ritsa from Works great - looks like a normal receptacle Looks and works great. It is bulky so does stick out more than a normal. Rated 5 out of 5 by Farcloser from Great product Easy to install and works as promised. Well made and as attractive as a receptacle can be.